Chicago came into Vivint Smart Home Arena on Saturday night with just 10 wins in 42 games, on the second half of a back-to-back after being blown off the court the night before by the Warriors. So, short-handed roster or not, back-to-back of their own or not, the Jazz had this one, right? Eleventh home win of the season in store? Third straight victory overall in hand? Apparently, someone forgot to tell the Bulls. The Jazz did eventually earn those achievements, but Chicago sure made them work for it along the way, as it took a deep fourth-quarter run for Utah to pull away for the 110-102 victory. It sure didn’t seem like it would be that hard early on. 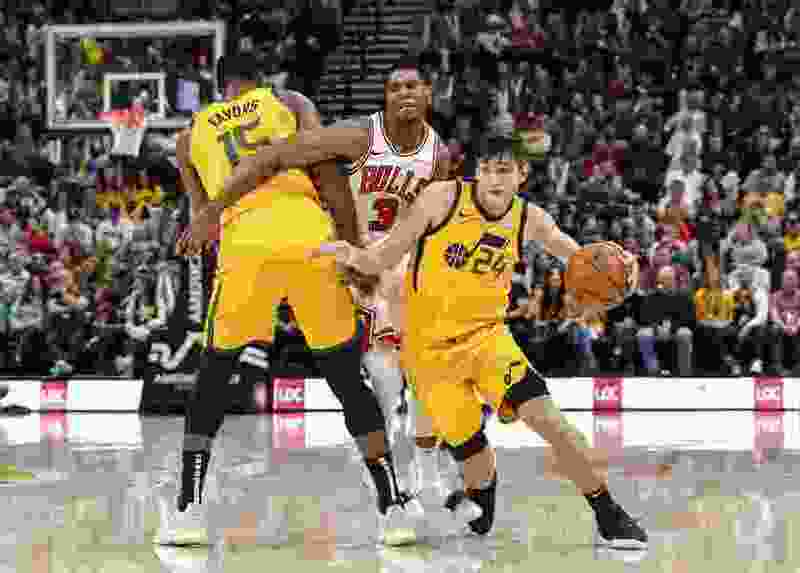 Joe Ingles drained a quick pair of 3-pointers, Rudy Gobert rammed home a putback dunk in transition, Utah’s rotating defenders were working to perfection and swarming Chicago at every opportunity, and it all added up to a 29-19 first-quarter advantage, which looked for all the world like it was bound to grow. Not much went right for the Jazz’s offense in the second quarter. A lack of flow led to bad looks. Then better looks came, but more makes did not. By halftime, Donovan Mitchell was just 3 of 9; Royce O’Neale 1 for 6; Korver 2 for 5; Jae Crowder 1 of 9. And with Utah as a team converting only 35.6 percent of its chances, the plucky Bulls were playing as though they belonged. Chicago’s own offense had no such efficiency issues in the period, as the Bulls outscored the Jazz 34-22 to take a 53-51 halftime advantage. Bit of an understatement. Whatever was said during the break, it had its intended effect, as the Jazz, at long last, caught fire. Mitchell kicked off the scoring by hitting a pull-up jumper, a floater, and a step-back J on Utah’s first three possessions. Joe Ingles followed with a layup, O’Neale threw down a dunk, Gobert cut through the lane for a dunk of his own. And then Mitchell drilled back-to-back 3-pointers. In all, the Jazz hit eight of their first nine shots to start the third period. But they had only a four-point lead to show for it, as Chicago answered every onslaught with a bucket of its own. Indeed, despite the Jazz’s apparently renewed firepower, they still trailed by a point going into the final quarter. About 4 1/2 minutes into the frame, they finally asserted themselves. Down 89-88, Gobert got free for a layin. Mitchell followed with a floater and a technical free throw. Korver drained a jumper. And when Mitchell drove in for a layup, the Jazz had a 9-0 run, a 97-89 advantage, and some much-needed breathing room. Utah’s dominant final period — won by a 29-20 margin — at long last broke the affair open. Ingles noted afterward that overcoming adversity has become par for the course with this team. Mitchell, as usual, led the way, totaling 34 points, six assists and six rebounds in his second straight start at point guard. Gobert finished just shy of a triple-double, with 15 points, 16 rebounds, and a career-high eight assists. The team’s resident sharpshooters, Ingles and Korver, each contributed four triples (the Jazz made 16 as a team) and 16 points. And so, disaster was averted, a loss to one of the league’s worst teams avoided on Utah’s third game in four nights. They will take it without complaint. Even if it didn’t come easy. Actually, perhaps because it didn’t come easy, it was that much better in the end.